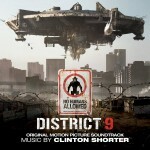 SpaceLab 9 are releasing Clinton Shorter’s score to the sci-fi hit District 9 on vinyl. This is the first time the score has made its way to vinyl. The release will be a double LP with gatefold jacket. Comes with a poster and bonus tracks. Release date is August 29, 2014. You can preorder now at Spacelab 9.